LOOK OUT! It was a Peewee Stampede at Sidewinders! You are here: Home / Speedway / LOOK OUT! It was a Peewee Stampede at Sidewinders! 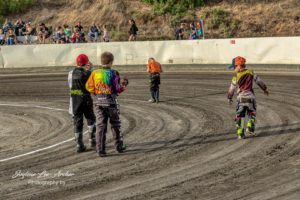 January 19th saw the running of the Peewee Stampede at the Sidewinders track in front of a good and enthusiastic crowd. The meeting was sponsored by former Gillman Speedway official and long-time speedway fan Daniel Steele and we thank him for his support. In fact Daniel was so impressed by the skill and sportsmanship of all the Peewee riders that he has asked could he again sponsor the meeting next season. Initially we had 21 nominations but three were unable to attend so 18 young boys and girls fronted the starter. 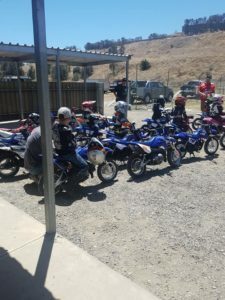 The field was split into four groups although getting the mix exactly right was a bit difficult as we had seven young riders having their first start at our track. Group 1 consisted of our known regulars and again it was Gidgit Neighbour and Darcy Bennett who showed the way sharing the first across the line honors between them. Blake Schlein and Riley Stout chased hard whilst big improver Jackson McPherson showed he was worthy of his step up. Riley was unfortunate to take a tumble late in the night when an over enthusiastic Jackson went for a gap that was maybe not there. Riley was able to get back on the bike and compete in the re-run and appeared fine having fun with the other boys and girls after the meeting. Group 2 saw three of our regulars in Grace Paul, Tristan Fiegert and Diesel Waddell joined by two newcomers in Reid Haydon and Esther Payne. It was newcomer Reid who stood out in this group as his previous experience in moto-cross was applied to our speedway track. He did not have everything his own way though as Grace and Tristan kept the pressure on and made him work hard. Grace was the unluckiest rider of night when after being first, second and third across the line in her first three events she was involved in a nasty tumble and appeared to injure her arm. We hope it is not too bad as she is a very popular competitor. Diesel and Esther battled on gamely to keep up with the other riders and had fun. Diesel also took a tumble in his second ride but came out and completed his following three rides. 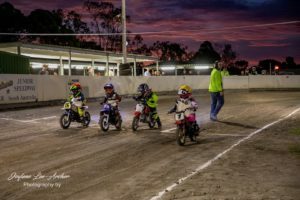 Group 3 saw three new riders in Cole Haydon, Miller Roberts and Hayden Kruger having their first experiences on a junior speedway track and Tanner Anthony made a welcomed appearance after missing a few meetings. Just like his elder brother Cole was the standout in this group. He was chased hard by Miller Roberts who also showed that he has a natural ability on a bike and will no doubt improve with more track time. Hayden and Tanner also showed that given more track time and practice they also will steadily improve. Group 4 consisted of two regulars in Riley Edson and Kayla Matthews and two first timers in Stephen Bass and William Nicol. Stephen immediately showed he will be considered for a step up in class as he dominated this group with five first across the lines. He was pushed by the improving Riley and just a short distance behind Kayla and William, who is the son of former Sidewinders rider Andrew Nicol, had some spirited battles. Riley drew applause from the crowd when after taking a minor tumble he got to his feet and gave a huge wave to the crowd to say ‘I’m fine’ and remounted his bike for the rerun. The Peewee section of the program concluded with a presentation of medallions and a goodie bag by our sponsor Daniel. The young riders were interviewed and many caused a smile with their cute answers. Smiles all round from riders, parents and spectators alike. The Peewees were supported by Solos, Novice solos and 50 cc classes. In the solo class our field was reduced to only three starters due to some riders being in Queensland for the Australian Titles, a couple with blown motors and a few still away, but the three who were there put on some exciting close finishing races. Regulars Harry Sadler and Jordan Hargreaves were joined by popular Mildura rider Lewis Monaghan in a series of scratch and progressive handicap races. Harry took the wins in the two scratch races from Lewis with Jordan falling in the first. The progressive handicaps proved an equaliser as Lewis took out the first two with Harry getting revenge with a win in the third. In all of this Jordan was not outclassed and was right there at the finish picking up two second places following another fall in the first of the handicap races. In fact in one of the races Jordan led for three and three quarter laps before faltering on the last turn to just get pipped for the win. Our two top riders in the Novice solo class Travis Clarke and Allegra Laanekorb shared the spoils while Kobi Canning, Ethan Fiegert and Hayden Kuckel had close competition between themselves. Kobi has a very smooth style and looks comfortable on the bike. He continues to improve. Ethan also is showing improvement now with more time on his bike and Hayden has also improved since he upgraded his bike to one of Hugh Evan’s former bikes. The 50 cc class completed the supports and we saw four new riders compete in this class. Reid Haydon, Caleb Boyes, Tyson Kruger and Brodie Smith joined regulars Travis Clarke, Gidgit Neighbour and Hayden Matthews. Reid joined Travis and Gidgit as the front running trio and Brodie, Caleb, Tyson and Haydon had close tussles not that far behind. So that concluded the competition side of the meeting. It was very gratifying to see the good crowd in attendance to support our young riders. It was also very pleasing to see the many happy smiling faces at the end of the meeting showing that everyone had a good time. Thank you to everyone who had a hand in making this meeting happen and of course the behind the scene helpers and officials, one final special thank you to Viv and Pete for helping out in the canteen all night and cooking the free sausage sizzle for all competitors and spectators at the conclusion of the meeting. That’s all. See you next time.